At least 111,000 Afghans, including civilians, soldiers and militants, are estimated to have been killed in the 16-year war. The Cost of War project estimated that 360,000 others have died from indirect causes related to the war, based on a ratio of indirect to direct deaths in contemporary conflicts. More than 31,000 civilian killed in war-related violence in Afghanistan, with 29,900 others wounded. During the first half of 2017, armed conflict continued to cause severe harm to civilians across Afghanistan, killing and injuring civilians at levels similar to the same period last year. Between 1 January and 30 June 2017, UNAMA documented 5,243 civilian casualties (1,662 deaths and 3,581 injured), marking a decrease of less than one per cent in overall civilian casualties. Civilian deaths increased by two per cent while the number of civilians injured decreased by one per cent. 3 Between 1 January 2009 and 30 June 2017, armed conflict in Afghanistan has claimed the lives of 26,512 civilians and injured 48,931 others. Child casualties increased by 9% to 436 killed and 1,141 wounded, compared with the first 6-months of 2016. Female deaths rose by 23%, with 174 women killed and 462 wounded. The UN Office on Drugs and Crime (UNODC) reported the area used to farm the poppy plant, the source of opium, and heroin, had increased by 10% (YoY) to 201,000 hectares in October 2016. “Afghan heroin has killed more than 1 million people worldwide since the ‘Operation Enduring Freedom’ began and over a trillion dollars has been invested into transnational organized crime from drug sales,” said the head of Russia’s Federal Drug Control Service, Viktor Ivanov. “Any impartial observer must admit the sad fact that the international community has failed to curb heroin production in Afghanistan since the start of NATO’s operation.” Ivanov said at the UN’s 56th session of the Commission on Narcotic Drugs in Vienna. Opium growth has increased by 18 per cent from 131,000 hectares (ha) to 154,000 [compared with 104,000 ha in 2005 and 7,606 ha in 2001] in the war-torn country, Ivanov told the conference. Afghanistan produces about 90 per cent of the world’s opium. 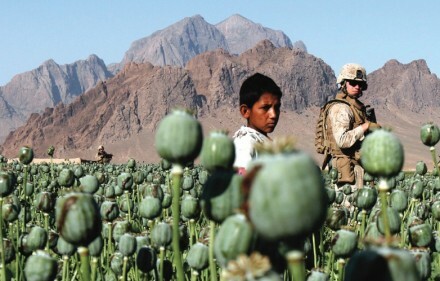 Opium production in Afghanistan is up from 185 tons a year in 2001, prior to NATO’s invasion, to 5,800 tons in 2012. Afghanistan produced about 820 tons of heroin in 2012, said Ivanov in his presentation. 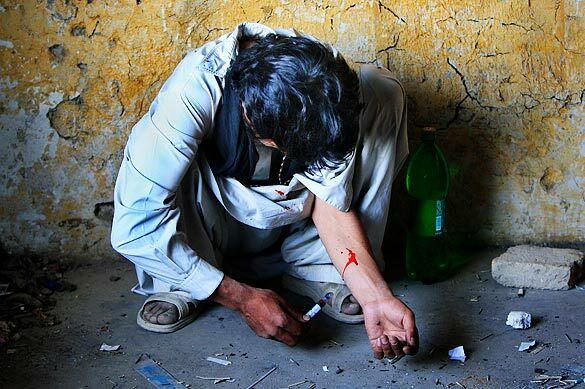 A heroin user injects himself at the derelict former Russian Cultural Center, a haven for drug addicts in Kabul. Photo credit: Peter Nicholls/The Times (UK). Image may be subject to copyright. Poppy Field in Afghanistan. Image source. Image may be subject to copyright. Heroin kills more than 30,000 people in Russia every year, and nearly all of the deadly drug comes from Afghanistan, BBC reported Victor Ivanov as saying. The heroin production in Afghanistan has now developed to a ‘global destabilizing factor,’ especially for Russia, Ivanov has previously stated. Drug injection is the largest factor for the spread of HIV in the U.S. A study by the National Institutes of Health found that 27 percent of all injecting drug users are HIV-infected. United States has an estimated 1 million heroin addicts.